It’s said in the wine world that the best fertilizer is the vigneron’s boots – meaning that if you want top-quality grapes, there’s no substitute for getting out among your vines. Add this footwork to painstaking archive research in the cadastral registers in the wine villages, and mingle in Jasper’s 30 years of experience in Burgundy, and you have the raw material for five brand-new, owner-by-owner ground plans of some of the starriest grands and premiers crus. These exclusive plans form part of our new BBR Press interactive eBook for the iPad, publishing June 17 on the Apple iBookstore. Readers will be able to tap to zoom in to the plans on their iPads, see the lists of landowners who grow vines there, and link directly to Jasper’s descriptions of each vineyard and his appraisals of the domaines. Côte de Nuits covers the most famous Burgundy vineyards of all: the red-wine villages of Gevrey-Chambertin, Vosne-Romanée and Nuits-St-Georges, among a dozen others. In ten chapters and nearly 400 pages, Jasper profiles over 250 vineyards and 130 wine domaines. As with the already-published Côte de Beaune, the new eBook has videos of Jasper explaining the lie of the land, and the roots of quality, in the vineyards. The much-praised maps of the wine villages feature ‘tap to zoom in’ technology: these maps “put all the electronic ‘e’s into Beaune Heaven,” as one reviewer of Côte de Beaune enthused. Jasper has updated the text from the 2010 hardback, adding profiles of a dozen new wine domaines. And with his on-the-ground research, he has been able to correct some misconceptions about vineyard ownership – presumably formed by those who do not like to get their boots dirty. 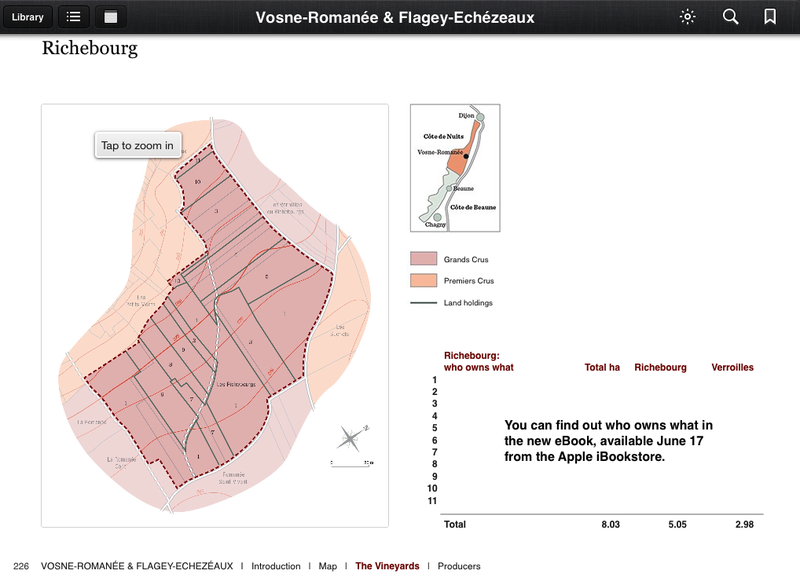 As a taster, here’s the plan of Grand Cru Richebourg. The numerals refer to the list of growers that in the eBook sits beside the map – and which links to Jasper Morris’ descriptive text. To find out who owns what – read the eBook. This entry was posted on June 5, 2013 by segravefoulkespublishers in Cote de Nuits, Inside Burgundy and tagged BBR Press, Berry Bros & Rudd, Berry Bros., Berry Brothers, Bourgogne, burgundy, cote de nuits, Gevrey-Chambertin, Grand Cru, inside burgundy, jasper morris, Nuits-St-Georges, Richebourg, Romanée Conti, Segrave Foulkes, Vosne-Romanée, wine.